Sometimes it will be hard to strict on authentic Bangladeshi recipe. I am begging apology for that. Today I am talking about chicken shashlik (my daughter’s favourite food ). Chicken shashlik is very easy and simple recipe which is loved by kids or adult. 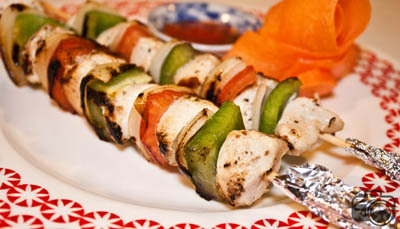 Those kids, who don’t want to eat vegetables, use more colourful vegetables on skewer. I promise that they will eat and will want more. In any case of any shashlik or skewer or kebab stick remember that less is more. So we need very little amount of spice and marination. Pick the bright colour combination and same size of fresh ingredient for this. Also needs skewers or toothpick. 1. Marinate chicken breast with ginger, black pepper, vinegar and salt and keep a side at least 15 minutes and longer is preferable. 2. Add tomato, onion and capsicum with it and make mix. 3. Now skewer them as your wish (chicken-capsicum-onion-chicken-tomato-onion-chicken). 4. You can cook them in pan or BBQ. Heat up the oil in a pan and place skewers. Fry them till chicken is tender in both sides. If you are using BBQ, use spray oil over skewer. 5. Serve chicken shashlik with your favourite sauce. Here you go that chicken shashlik can make just 20 minutes with little bit of effort. this was awesome. I was fortunate to taste this one and thanx bhabi for such a nice food. Why not in Bangla Letter? Thanks for visiting banglarecipes site and leaving the comment. We all love our language and culture. We build this site in English as Bengali is not searchable using major search engines. Also We want to make our great food popular internationally. However we have a plan to integrate a Bengali version of this site in near future. Thnx apu for ur nice recipes!!! !